Materials wharf timber, corrugated steel sheet, water pipe, stainless steel shafts and bearings. 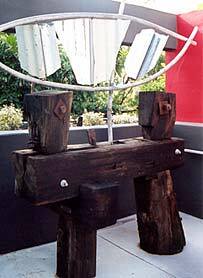 This sculpture is a wind operated sculpture that uses wharf timber as its anchoring elements. The architect's design created outdoor 'windows' that I decided to use for their original meaning of 'wind-eyes'. The three sails turn even in light breezes, spinning the story of arrival in the new land and also of the windmill that occupied this spot in the early days of the colony. The sails are made from the steel roof of the building that stood on this land prior to construction of the new home.